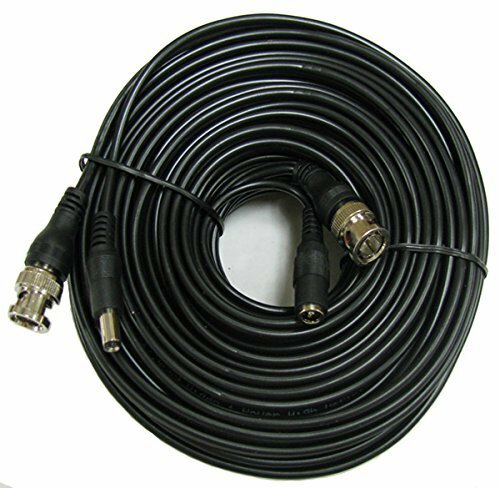 This pre-Made BNC CCTV Cable with Power wire. It is not only used in regular CCTV camera. but also used in 1080p/720P HD CCTV Camera, like SDI, TVI, CVI, and AHD. The cables is perfect for CCTV Camera to transmit video and DC power. This product is CIB brand. Please report to Amazon or USA Security Store if you received products without CIB logo. CIB is a registered trademark of CIB Security Inc. This Vandal Indoor/Outdoor Bullet camera is ideal for your surveillance applications. This camera works on day and night and it will do automatically switch to black and white picture at night. It provides you with the clear high resolution image. Equipped with 30 LEDs, this camera will make any objects visible up to 80FT. The camera easily connects to your TV, VCR or security monitor for the protection of your home, office or other valuables. 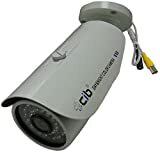 --CAMERA SPECIFICATION-- * Vandal Proof Day and Night * Indoor Outdoor, Wall mount or Celling mount * NTSC:960(H) X 592(V) * High Resolution 800TV Line * 0.0Lux/F1.2 * Camera Lens 3.6mm * Day and Night 30 LEDs Up to 80ft * Electronic shutter, 1/50(1/60) «1/100,000ses * Operation temperature, -20«50 * Power supply, DC12V * Dimensions(mm):75(D)x75(H) * Weight(g):230(g) * Bracket is included This item does not included power supply and video cable. If you need power supply or cable, please check our storefront on Amazon. This product is CIB brand. Please report to Amazon or USA Security Store if you received products without CIB logo. CIB is a registered trademark of CIB Security Inc. This 4CH Color Quad processor is idea for your surveillance applications. The Quad easily connects to your TV, VCR or security monitor for the protection of your home, office or other valuables. QUAD FEATURE * 4CH Video Input * 1xCH Audio Input * 1xCH Video/Audio Output * 720x480 60Hz for NTSC * QUAD Split * Full Screen * PIP Screen * Dual Split Mode * Auto Sequence * Flicker Free Image Capture * Selectable Zoom Area * Camera Title * Real Time and Date * Alarm Input * Video Loss Detection * Event Report * Built-in Buzzer and Relay Output * DC 12V Input * This product is CIB brand. Please report to Amazon or USA Security Store if you received products without CIB logo.